PIN No and confirmation !! This topic contains 22 replies, has 1 voice, and was last updated by Mick 2 weeks, 1 day ago. Mr P, I’m still waiting for my PIN number, website says my order has been accepted. Hope it comes tomorrow as ordered day after you did. Any news on build date? The salesman said he will be in touch nearer the time, as also stated in the letter from Motobility, hope this helps? Hi again, postman’s been and still no letter also the car rep gave us a probable delivery date but also stated that the Citroen website wasn’t showing a build date for the 1.6. They did try get us to take the car in the showroom same colour and spec as our order but wife wasn’t happy about that as it had been there two weeks with everyone visiting sitting in it etc. She is the boss ha ha. I will wait until Friday for PIN number and if no joy phone motabilty. We were never offered choice of number plate, how does that work? Hi Mick, hopefully your letter will arrive this week, appears we both had different experiences. Possibly because ours is a reorder (after 3 year lease of current car) and you’re new to the scheme and it’s your first order. We’re unable to take receipt of our car until this current lease runs out which is 13th June. Whilst we were ordering the car, the salesman turned his computer screen towards us. There was a choice of around 20 registrations for us to choose from. All confirmation appeared on the screen and he gave us a print out to take away. Hi Mick, can you put in the link for the Citroën™ site where you check the build please? Hello again Mr P, our postman arrived at 1400 with my welcome letter and PIN number, apparently the guy I though was the postman this morning was just posting leaflets through the doors. Now it’s a car I’m waiting for . …brilliant news Mick, as I said earlier, I think you’ll get yours before us as it’s your first Motobility car. Were as we have to wait for lease to run out on our current car. …East Sussex, the dealer is in Battle. …Ronny, what car did you go for? It’s a nice feeling when you get the car you want. We were led down with our first car, put us off for about 6 months. I used the auto auto main beam tonight for the first time, mighty impressed as to how the car knows? Got to be the easiest car to drive on the scheme at the moment. Not far off driving itself with DSG the intelligent cruise and the lane assist cornering auto headlights auto wipers auto main beam and showing 57 mpg to Worthing from London and home tonight. You can just relax and have a massage while you’re driving. Hi Philjb, what model and spec car have you got? Hi Mr P, any news on your car build date yet? Hi Mick, no, I’m not expecting to hear anything until at least 2 weeks from date I was given ( 14 June). I just hope we don’t have similar issues Peugeot 5008 orders are having on here. 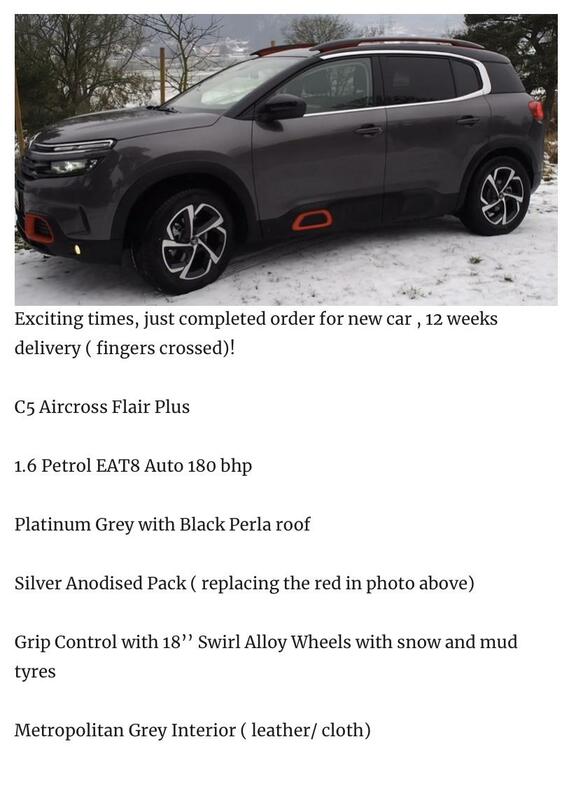 As Citroën™ use same platform and gearbox etc? I just come back from shops and seen C5 on the road, looks very nice! Hopefully a sign that they are getting them made and on the roads. it was prob the best spec with comforts and tech suv on the scheme when I was looking. Reply To: PIN No and confirmation ! !